Sell More CD's, Get Better Gigs, & Make More Money With Your Music. The Musician's Corner® = Psychology for Success in Music. Who's this for? New Bands, Musicians, Managers, & Parents. Rise Above the Competition... Right From the Start! You know the music; now you need to understand the business of marketing & selling your music effectively, ongoing. DISCLAIMER: If you're expecting a run-of-the-mill, boring, slow moving, monotone audio book that rivals the excitement of watching paint dry, then DON'T buy this CD!! Do you want to get your music out of the basement and onto real stages? Would you like to eventually make a living playing music full-time? Do you want straight-talk on how to really get ahead in your music career from someone who's been there, done that for over 20 years? - Market & sell your music more effectively, more often. - Identify & avoid the many mistakes that beginning artists make. - Embrace the many successful techniques beginning artists miss. - Get more gigs in your area. - Get better paying gigs in your area. - Get venues & event planners calling you for appearances & bookings. - Earn more money & more contacts from your concerts & appearances. - Sell more CD's and merchandise. - Keep your band or group's turnover to a minimum. - Identify the traps that kill bands before they really get started. - Market & promote yourself in ways your competition isn't. - Enlist the help & support of your competitors. - Get your competition's fans to become your fans immediately. - Get FREE media coverage on TV & Radio. - Turn your media appearances into powerful promotional events. "Money, Marketing, & Myths Inside the Musician's Corner®" is designed to entertain and enlighten entry-level artists, experienced veterans, and enthusiastic fans of music alike with proven marketing & promotion strategies that deliver results! Not only an audiobook of techniques and strategies for marketing and selling yourself and your music effectively, "The Musician's Corner®" also tackles the tricky task of teaching musicians, performers and parents of musicians the effective communication secrets necessary for success in today's music business. By tapping into the many subjective strengths we all possess, the Musician's Corner® will encourage, challenge, and inspire you to gain a competitive edge over your contemporaries. 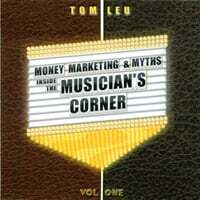 "Money, Marketing, & Myths Inside the Musician's Corner®" is a highly informative Book/CD set that should be an indispensable part of any serious musician or artist's library." "Any musician who adheres to Tom's enlightening words will realize a career in a band takes more than being a great player, and will make a point of becoming well informed on the business aspects of music..."
Grammy nominated songwriter and author of "The Art of Writing Great Lyrics and The Art of Writing Love Songs"
"Tom Leu's "Money, Marketing & Myths Inside the Musician's Corner®" is a fast-paced thrill ride through this crazy business of music. Tom offers great tips on promoting yourself, making money, attracting fans and avoiding the common problems that plague most aspiring musicians." "Tom Leu of the Musician's Corner® provides OnlineRock with articles that speak to the core of our 12,000 members. His passion and insightfulness along with his real-life experience help guide musicians on their journey. Whether you're a musician who is just starting out or one who's a veteran of the industry, the Musician's Corner® is the place you need to check out." Tom Leu is the creator of THE MUSICIAN'S CORNER®, a nationally syndicated resource for musicians, bands, and fans of music to gain insights and information on thriving and surviving in the music business. The Musician's Corner® articles, books, and audio programs offer musicians proven strategies and techniques to market and sell your music more effectively, more often! Tom writes & produces Musician's Corner® radio programs, and as a journalist, contributes to numerous online and print publications. Tom is the author of the Musician's Corner® resources and also hosts and co-produces a television talk-show which features the Musician's Corner®. Tom has been a working musician and manager for over twenty years. Solid ideas, that you can really use. I listen to this CD over and over and always come away with something that will work with the bands I manage. and use the ideas he's talking about. It doesn't matter what level you are at, there are many great ideas here to advance your career. point you in the right direction with much common sense thought. It’s up to you! Get to work!